Multiclass classification and regularized regression problems are very common in modern statistical and machine learning applications. On the one hand, multiclass classification problems require the prediction of class labels: given observations of objects that belong to certain classes, can we predict to which class a new object belongs? On the other hand, the regularized regression problem is a variation of the common regression problem, which measures how changes in independent variables influence an observed outcome. In regularized regression, constraints are placed on the coefficients of the regression model to enforce certain properties in the solution, such as sparsity or limited size. 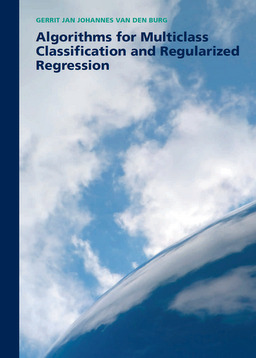 In this dissertation several new algorithms are presented for both multiclass classification and regularized regression problems. For multiclass classification the GenSVM method is presented. This method extends the binary support vector machine to multiclass classification problems in a way that is both flexible and general, while maintaining competitive performance and training time. In a different chapter, accurate estimates of the Bayes error are applied to both meta-learning and the construction of so-called classification hierarchies: structures in which a multiclass classification problem is decomposed into several binary classification problems. For regularized regression problems a new algorithm is presented in two parts: first for the sparse regression problem and second as a general algorithm for regularized regression where the regularization function is a measure of the size of the coefficients. In the proposed algorithm graduated nonconvexity is used to slowly introduce the nonconvexity in the problem while iterating towards a solution. The empirical performance and theoretical convergence properties of the algorithm are analyzed with numerical experiments that demonstrate the ability for the algorithm to obtain globally optimal solutions.